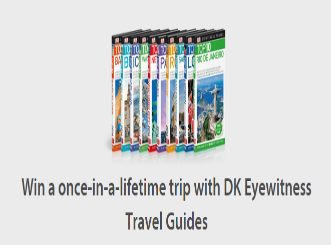 DK Eyewitness Travel Guides Win A Once-In-A-Lifetime Trip Sweepstakes – Win $4,000 for a trip & more! Win $4,000 to use for a trip & more! ENTER SWEEPSTAKES HERE – DK Publishing Sweepstakes page. ENTRY LIMIT – Only one entry per person. ELIGIBILITY – This prize draw is open to residents of the United Kingdom, the United States of America, Canada (excluding Québec) and the Republic of Ireland aged 18 years or over or who have reached the age of majority in their respective country, province or state, with the exception of employees of the Promoter, their families, agents and anyone else connected with this promotion. SWEEPSTAKES ENTRY PERIOD – Entries must be received by 11:59 p.m. BMT on Friday, 1st April 2016. PRIZES – The grand prize winner will receive £2,600.00 GBP/$4,000.00 USD to be used for a trip to one of the DK Eyewitness Travel Top 10 destinations (Barcelona, Berlin, Iceland, London, New York City, Paris, Rio de Janeiro, Rome, San Francisco, or Washington, D.C.) and a Top 10 travel pack as outlined below (Approximate Retail Value (“ARV”) £2,615.00GBP/$4,025.00 USD). The winner is responsible for making all travel arrangements and obtaining all necessary visas or other travel documentation. Nine runners-up will each receive a copy of a DK Eyewitness Travel Top 10 guide worth £7.99 GBP or $14.00 USD of their choice from the newly relaunched guides: DK Eyewitness Travel Guide: Top 10 Barcelona, DK Eyewitness Travel Guide: Top 10 Berlin, DK Eyewitness Travel Guide: Top 10 Iceland, DK Eyewitness Travel Guide: Top 10 London, DK Eyewitness Travel Guide: Top 10 New York City, DK Eyewitness Travel Guide: Top 10 Paris, DK Eyewitness Travel Guide: Top 10 Rio de Janeiro, DK Eyewitness Travel Guide: Top 10 Rome, DK Eyewitness Travel Guide: Top 10 San Francisco, DK Eyewitness Travel Guide: Top 10 Washington, D.C.; a tote bag, a travel journal, and a pen (Approximate Retail Value (“ARV”) £16.00 GBP/$25.00 USD each).